Command dial: After you activate certain camera features, you rotate this dial, labeled in the figure, to select a specific setting. For example, to choose a shutter speed when shooting in shutter-priority (S) mode, you rotate the Command dial. AE-L/AF-L button: Pressing this button initiates autoexposure lock (AE-L) and autofocus lock (AF-L). You can adjust the performance of the button as it relates to locking focus and exposure, too. 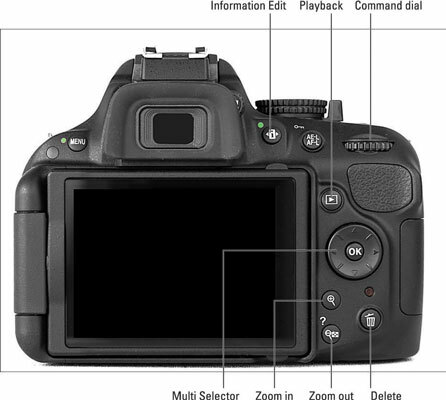 Multi Selector/OK button: This dual-natured control, labeled in the figure, plays a role in many camera functions. You press the outer edges of the Multi Selector left, right, up, or down to navigate camera menus and access certain other options. At the center of the control is OK, which you press to finalize a menu selection or other camera adjustment. Delete button: Sporting a trash can icon, the universal symbol for delete, this button enables you to erase pictures from your memory card. Playback button: Press this button to switch the camera into picture review mode. Menu button: Press this button to access menus of camera options. Display help screens: The little question mark symbol is a reminder that you can press this button to display helpful information about certain menu options. Display thumbnails during playback: In playback mode, pressing the button enables you to display multiple image thumbnails on the screen, thus the little thumbnail grid on the button face. Reduce image magnification during playback: If you magnify an image during playback, pressing the button reduces the magnification amount. The magnifying glass with the minus sign tips you off to this function. Zoom In button: In playback mode, pressing this button magnifies the currently displayed image and also reduces the number of thumbnails displayed at a time. Note the plus sign in the middle of the magnifying glass — plus for zoom in. Information Edit button: Press this button once to display the Information screen. Press again to activate the control strip at the bottom of the screen, which enables you to quickly access certain shooting settings.